Marla Murasko stopped by the HCAM studios to speak about her and her Sons State House visit during "Massachusetts Down Syndrome Advocacy Day" and her new book "Adventures with a Special Traveler". Marla's 11 year old son, Jacob was diagnosed with down syndrome and a congenital heart defect. Here's a preview of the one of the latest episodes of Meet Your Neighbor produced by Cheryl Perreault as she talks with Mehr Kaur. The complete program will air in September and is currently available online here. Ray Drawe is a Hopkinton senior resident who is often found greeting people by the door of the Hopkinton Senior Center. He is also well-known for spreading a little joy on his visiting throughout the Center, standing at attention to Taps regardless of how cold the weather, and even tripping the light fantastic on the dance floor most Friday afternoons with his wife. In his life, he has endured some of the most difficult of challenges including growing up in the Depression with a father disabled by bullets and mustard gas from the war, having his first daughter diagnosed with polio just weeks before the vaccine was released, losing a young son to a motorcycle accident and more recently, dealing with cancer of the stomach, lungs and bladder. Yet according to friends, Ray consistently remains positive of spirit. 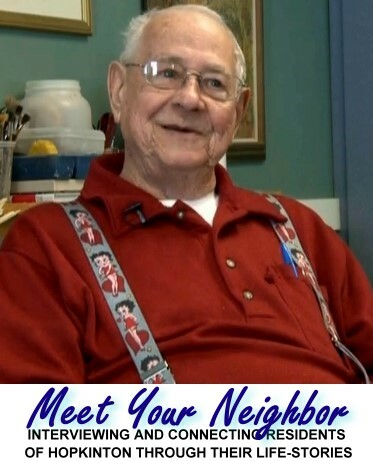 On the day of his interview at the Hopkinton Senior Center, he is wearing a bright red shirt, comical Betty Boop suspenders and a shy, but warm smile on his face. As one sits down to talk with Ray about his life, it's obvious that he has endured life's challenges by counting on the support of his family and Hopkinton neighbors. He has offered the same to those in need as well. It is also obvious when he gets through the hard times, Ray prefers to be enjoying life to its fullest... helping others, taking classes, laughing and even making time for a little dancing on a Friday afternoon. I understand that you spend a good amount of time at the Hopkinton Senior Center each week and you work as a greeter here? Yes. Two days a month on Wednesday. It's a real good thing because you meet people. That's the whole idea and you open the door for them, take them for a little cruise of the building. I have met many, many people here, mostly seniors of course. What do you do at the Senior Center otherwise? We play pool, also have dinners and lunches here (the lunches are very good). There's a Veteran's breakfast the first Friday of the month. The first Sunday is Taps. Five minutes after seven o' clock they start playing Taps and that is all over America. Almost every town in America is doing this and now Germany is doing the same. We get about 15 people there in the cold weather (laughs) and we get more to come out in the warmer weather. Taps always brings something out in people. It's a good thing. What did you do in the Military Service? I was in the Navy between 1948 and 1952. I was all over the world, mainly in Europe. We were called over to Korea so we left from Italy. We went to the Suez Canal and ended up in Korea...so I got a cruise! Do you still keep in touch with other veterans you were with? There aren't many left anymore. The ship was named U.S.S. Worcester, named after Worcester Massachusetts. It was a cruiser....a big ship. Did you come to Hopkinton after your time in the Navy? Well I met a girl...(laughs) and then I stayed in Framingham. I went to work at the J.J. Newberry Department Store which is like a Woolworth's store. That's were I met my wife and we've been here ever since...59 years ago now. At J.J. Newberry's. We dated like everybody else. Framingham had three movie theaters. On Saturday night they'd roll the sidewalks up until Monday. Everything closed but the movies with the blue laws. Movies was the big date for us. We got married in 1952. Eventually you moved here to Hopkinton? Over 35 years ago. My daughter was the first one in Hopkinton to get polio in 1955. In a few more months the vaccine would come out. She had a tough time. When we brought her to the hospital, she was like a dishrag. She could only move her neck. We thought we were going to lose her but Children's Hospital in Boston is a fabulous place and the people in Hopkinton were A-number one. How did people in Hopkinton give support? They back you up. If we needed a ride or something, there was always someone there to help. So it sounds more like a family, that there was always someone there to get you through? That's right. But people were afraid too, that they might contract the polio. So you had these challenges in your life? I also lost my oldest boy to a motorcycle. He was 21. You had some true hardship in your earlier life. More recently I know you have been dealing with cancer these last three years? Yes in my lungs, stomach and bladder. But we killed most of it. So you are almost cancer free. What did you find that got your through these past recent hard times? It sounds like you have a lot of positive things to say about the Hopkinton Senior Center and likewise, I know people there have many positive things to say about you. And I understand that you recently received your GED. Congratulations to you. I quit school in eighth grade and went to work. In those days, that was standard. When I went back for my GED, there were 18 of us in the class, mostly 15, 16, 18 years old and a few senior citizens as well. It was kind of hard that it was all young kids there. In what way did it work? The younger people looked up to the older people. That made a big difference. It was a bit scary for the older people to be there (laughs). And back in time...when YOU were younger....where did you grow up? I was born in Michigan and lived with my parents and sister in a little town called Rockwood. Then we moved to Detroit when I was five years old. Things were tough then with the Depression, there were no jobs. My father was shot up in the war and he was gassed with mustard gas. That kind of ate him up. He died in 1943. We were young kids then. We didn't realize how tough it was until later. What did you like to do as kids? We had snow there all winter. Snow, there was snow that kept coming and it was cold because of the cold from the lakes. So we did ice skating, hockey, figure skating...winter sports. In summer of course there was baseball. I know you have a number of hobbies and interests now, is there anything you still are interested in since childhood? I think things are different. We had Monopoly. In summertime it was a good time for baseball and of course the war was on so you had to play "cowboys and indians" with all of your neighbors and play army and pretend war in your play with the Germans or the Japanese. My mother and father taught me how to garden. Most everyone had gardens then they called Victory Gardens. Everyone had tomato plants at least. I have a couple of tomato plants now. I leave the gardening up to my son. I understand that you do a little dancing these days too? We love to learn how to dance. We really want to learn how to waltz, so we give it a try over at Holliston where they have dancing on Friday afternoons. In closing, I was wondering if there was one thing that you could wish for this world, what would it be? Peace. I'd like to see our boys home. I don't see any reason for their being there. It's just terrible to lose young people like that. And how about yourself? How would you like to be remembered in this life? Hmmm (laughs) I really don't know that answer. How about that you have been someone who is well-known and respected in the community? Maybe being a "people person"... given how much people have meant to you? How strong a force they have been to you in your life? Yes. They are. Especially my daughter.